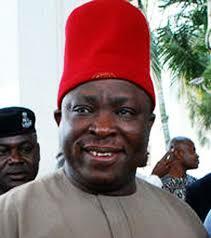 Senator representing Anambra Central District, Victor Umeh, yesterday said he will not defect to either the All Progressives Congress (APC) or the People’s Democratic Party (PDP), but would remain in the All Progressive Grand Alliance (APGA), despite political manoeuvring in the National Assembly. Victor Umeh said his people elected him to represent them effectively at the National Assembly and not to defect to another political party or to impeach anybody in the Senate. The Senator, who stated this at the weekend while speaking with newsmen in Onitsha, Anambra State said the National Assembly would definitely approve the Independent National Electoral Commission (INEC) budget for the conduct of 2019 election because it called for national duty, saying the leadership of the Senate would inform members when to reconvene for the approval. “The defection of some members is not senate business, it doesn’t concern APGA. APGA as a political party is friendly, you know the cap I wear, I will never defect, I will remain an APGA senator as much as the opportunity is there. I will never defect and my sister who has returned home to APGA, Senator Stella Odua is also in the same league with me and will not defect. There’s no Anambra Citizen who’s in doubt abt the loyaty, the stead fastness abt the Loyalty of Senator Sir Umeh to the ideals of the founding father of APGA,Our late sage,Ikemba Nnewi,Ezegburugbu-ru Ndi-Igbo,to give the South East, Sence of belongn & the platform to actualise the political ambitions of the Ibo Nation.In the Nations politics of the ethnic,hate & religioue driven political tarin of Nigeria. However,it’s sad that instead of keyn to the great vision & love for the Ibo Nation by our late Sage,Ikemba Nnewi. Some disdent politicians frm the South East due to Corruption,Sabotage & inordinate quest for,Vanitious mundane pursuits,ve chosen to betray the entire Ibo Nation,by sacrificing the collective interests of Ndi-Igbo for mere porriage & Crumbs frm the table of the known traducers of Ibo prople in NAIJA. I firmly belief that Wt the political events & the awareness of great No Ibo,nay Nigerians youths: The 2019 Gen Elections, will determine the real Ibo polical leaders frm those arrogating the leadership of Ibo Nation to themselves.ONYE AGHANA NWANNEYA !